I’m a day late in climbing out from under the ever-piling heap called my feed reader — but hey, if Punxsutawney Phil can claw his way to the surface today, I can too. Here’s the search news from over the weekend through today, with a special focus on local and mobile news. The Local Events application in Bing now features event listings. From Bing Maps, go to the Map Apps (if you don’t already have Silverlight installed you’ll be prompted to download it) and select Local Events. 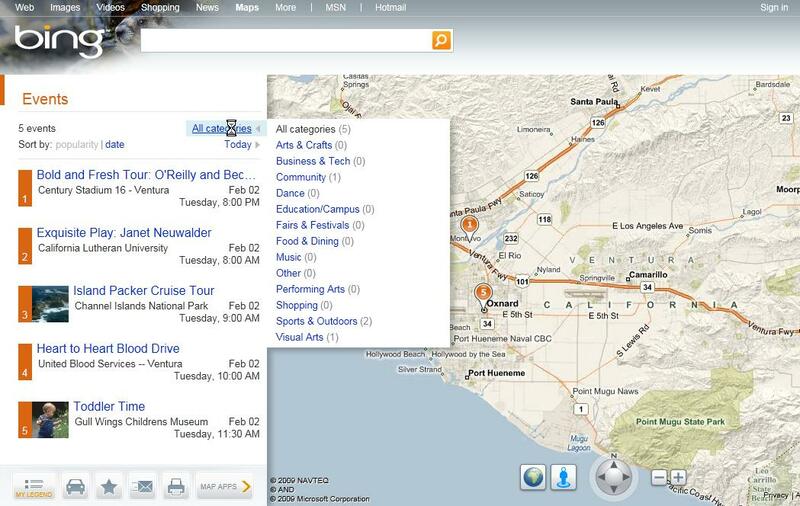 From there the local events will populate on the map as well as the navigation pane to the left. From here you can sort events by date and category. [Unless it breaks your browser altogether, like it did for me. –Susan] Currently, the calendar and event site Zvents is feeding the event listings to Bing, and more listing partners may be in store for the future. Google Maps is also boasting a new feature called Enhanced Listings. The feature allows local businesses to add rich media to their listings for a $25 per month fee. The categories for enhancement include photos, videos, coupons, menus and more. Users will see a yellow indicator next to the businesses map listing, which they can select to expand and view. Businesses can apply for and control this feature through Google’s Local Business Center. The Firefox browser is now mobile ready, complete with many features power users have come to rely on. Known for its expansive library of add-ons, Firefox Mobile is now the first and only mobile browser to support add-ons. Other features include Weave Sync, which allows for saved history, bookmarks, tabs and passwords for seamless computing between desktop and mobile devices. And the Awesome Bar lets users search for favorites and previously visited pages. Currently it’s only available for the Nokia N900, but here’s hoping it rolls out to other devices soon. In a neighborhood in Vancouver, Canada, one crime raises questions over Google Street View‘s violation of personal privacy. A resident applied for two permits required to cut trees of a certain size, and ended up cutting down 23 instead. The act was caught by a Google Street View automobile, and now prosecutors are deciding if and how the images can be used as evidence. Does the fact that the individual was committing a crime excuse the invasive way the evidence was gathered? Privacy advocates have long been wary of Google’s Street View photography, and I have to wonder if this case highlights the fine line between information gathering and privacy violation. That’s it for your weekend in local search. As always, stay tuned throughout the week for more news and analysis. Until then, stay local! Nice One….You Give good update..this is useful for all.When it comes to starting up an online business, search engine optimization (SEO) can be the most advantageous element to make your site visible to all searchers.